WITH the days warming up and getting longer, WIRES warns the public that puggle season is approaching. Now is breeding time for echidnas, and females may be carrying either an egg or a very small echidna, known as a 'puggle'. Echidnas do not actually have a permanent pouch, instead they have contracting muscles in their abdomens, which form a pouch-like fold. After 10 days in the egg, the puggle taps on the inside of the egg with what is called an 'egg tooth' to break the soft shell. 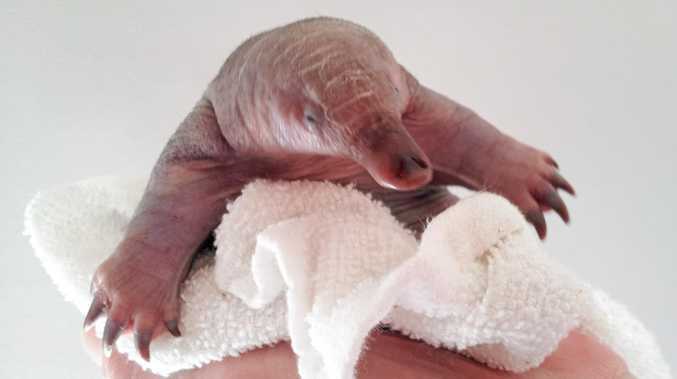 It then stays in the pouch for a further two months until it starts to develop spines, at which time the mother will dig a nursery burrow in which she will leave the puggle. She will close up the entry and return every two-10 days to feed the young through a series of mammary pores on her stomach. WIRES would like to ask the public to be especially vigilant at the moment in regard to echidnas. Should you come across an injured Echidna please stop, check underneath the animal as well as the surrounding area. The impact from a car accident can cause a puggle to roll some distance from mother's body. A search can often locate a tiny spineless puggle, which will be rolled into a ball and may look like a pink-grey clump of clay. Please call WIRES Northern Rivers (6628 1898) straight away if a puggle is found, as they require specialist intensive care immediately. If you find an adult echidna which may be injured, WIRES also asks that you contact them immediately for advice. Because of their spines, echidnas are difficult to handle. Be sure to let WIRES know exactly where you find the Echidna so the animal can be returned to the exact location for release.